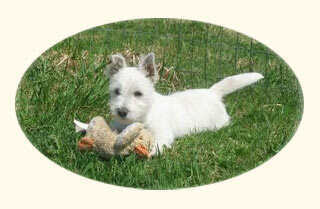 Temperament: The West Highland Terriers are independent, assured and self-confident. They make good watchdogs. They are loyal to their owners and like to be social. It is a hardy breed, but can be stubborn. Having the typical terrier prey drive, they tend to be highly interested in toys, especially chasing things. History: Scottish white terriers were recorded as early as during the reign of James VI of Scotland, who reigned between 1567 and 1625. The king ordered that a dozen terriers be procured from Argyll to be presented to the Kingdom of France as a gift. Sandy and brindle coloured dogs were seen as hardier than those of other colours, and white dogs were seen as being weak. At various times during the breed’s existence, it has been considered a white offshoot of both the Scottish Terrier and the Cairn Terrier breeds. There were also reports of a ship from the Spanish Armada being or so on wrecked on the island of Skye in 1588. This ship carried white Spanish dogs, whose descendants were kept distinct from other breeds by Clan Donald, including the families of the Chiefs. Other families on Skye preserved both white and sandy coloured dogs. One such family was the Clan MacLeod, and it was reported by their descendants that at least two Chiefs kept white terriers, including “The Wicked Man” Norman MacLeod, and his grandson Norman who became Chief after his death.